In every neurodegenerative disorder, certain types of neurons die. 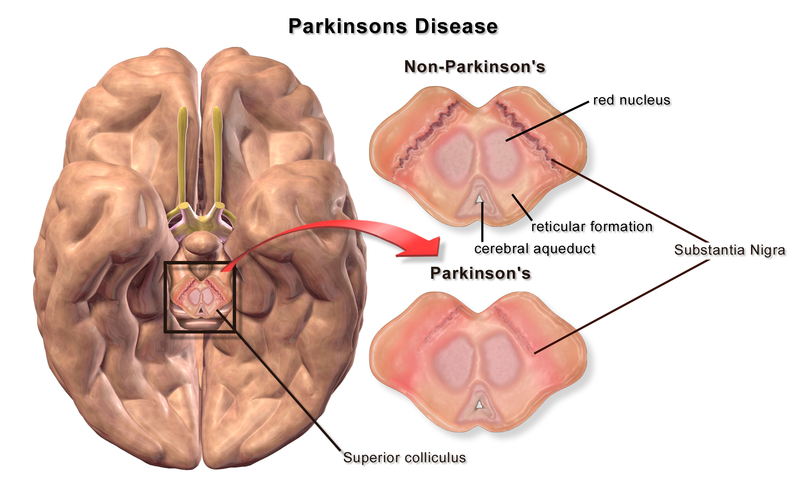 In Parkinson’s disease, the degeneration is most pronounced in neurons in the brain that produce dopamine, a chemical that plays a critical role in the functioning of the nervous system. The most-affected neurons are located in a region of the brain called the basal ganglia, deep towards the ‘center’ of the brain, and especially a component of it called the ‘substantia nigra’. As the name suggests, this region of the brain looks black, which made it one of the first parts of the brain to be identified and named. I’ll explain why it is black here. Dopamine is a neurotransmitter, which means that it is one of the molecules responsible for communication between different neurons. It plays a central role in motor control, which simply means control over bodily motions. It also plays a role in psychological processes like motivation and pleasure. Some illegal drugs like cocaine produce their ‘high’ in part by causing a rush of dopamine. Given dopamine’s many critical roles, bad things happen when you don’t have enough of it being produced, such as when the dopamine-producing (‘dopaminergic’) cells die in Parkinson’s disease. Points 2 and 3 imply that Parkinson’s disease results not only in motor symptoms, such as shaking, which are easy for others to see, but also psychological symptoms, such as depression, which can be just as serious. If you have forgotten your high school chemistry: the lines represent chemical bonds, H is hydrogen, N is nitrogen, and O is oxygen. Carbon atoms would be C, but to simplify the diagram, these letters are omitted, and the locations of carbon atoms are implied by the intersection of the line segments. In this case, there are 8 carbon atoms. It’s a fairly simple molecule, but a rather strange choice for a neurotransmitter, because it is quite reactive; some people even refer to it as ‘toxic’, but that is an exaggeration, not to mention that it sounds rather alaming. I will return to this issue, as well as the way your body produces dopamine, in later posts.